Another week, another buncha dead carebears. I wonder how many were persuaded to follow the Code? As long as the answer is greater than zero, we're making progress. Fractional carebears (those who need to be ganked more than once to learn their lesson) count. Let's review some of the fallen bot-aspirants from the week of April 13th @ 00:00 EVEtime through April 19th @ 23:59 EVEtime. It's a beautiful thing. Even deadspace is no place for a carebear to hide. It's just a longer trip to oblivion. The deadspace victim, Arahbeth, belonged to the fittingly-named B.O.O.M ECONOMICS SOLUTIONS corp. Agent Dreadchain showed her why it's called "deadspace". Wynndee learned there's no running from the law--or an officer of the law like Agent the reaverkiller. The thing about speed fits is that you need to go all-in. Wynndee was willing to sacrifice tank, sure, but she didn't fill her rigs or buy a snake set. No wonder her Retriever was only going very slowly instead of just slowly. 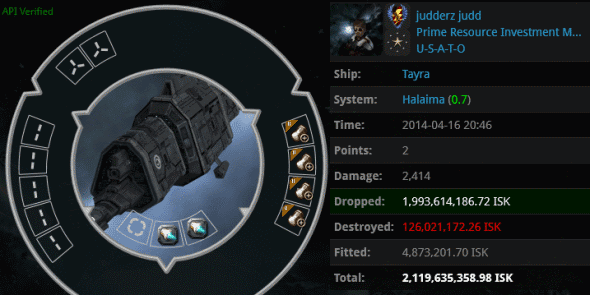 judderz judd, one of the few members of liberty's U-S-A-T-O alliance, lost a 2.1 billion isk fail-fit industrial to RaiderMoon. I'd say liberty's new/old alliance isn't off to a great start. Appropriately, the disaster took place in Halaima. ...and most of the loss came from a Retriever BPO. If anyone else is in U-S-A-T-O, how many more omens do you need? The freighters continue to drop like flies in the Isanamo system, where Agent loyalanon has been leading fleets for weeks now. When will these carebears learn? Among the dead was Modan Ikkala, who lost a 4 billion isk Charon. 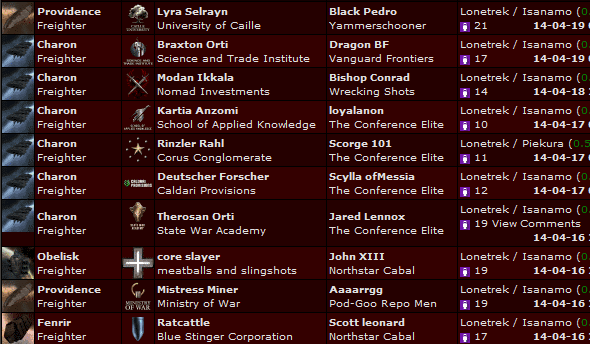 Judging by his cargo, he does business outside of highsec. 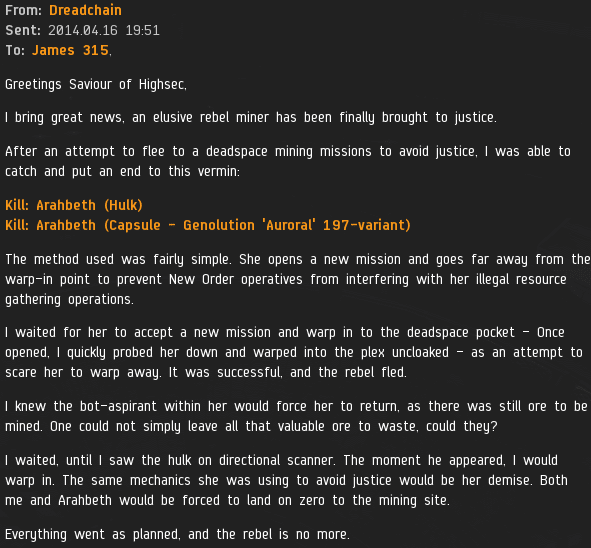 However, just as highsec residents must follow the rules of nullsec when they venture to 0.0 space, everyone in EVE must abide by the Code when in highsec. Agents Bishop Conrad, Pestario Vargas, Klaxor Gaterau, Jared Lennox, loyalanon, Dragon BF, unknown boat, iZaEaRl, Jebediah Phoenix, kidkoma, Scylla ofMessia, Tyr Dolorem, Paz Heiwa, and Black Pedro delivered the lesson. You might ask, if so many freighters continue to die in Isanamo, why isn't anyone doing anything to stop it? Where's the resistance? ...They were completely ineffective. Indeed, our brave Knights, encouraged by the overflowing New Order Treasury, have so much firepower at their disposal that they can allocate additional DPS to nearby rebels. 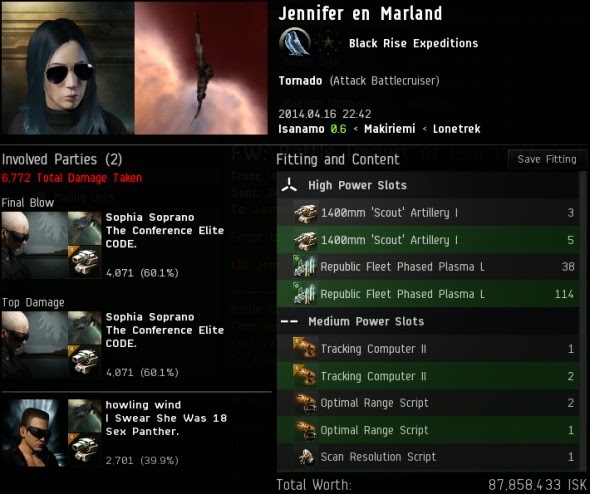 Jennifer en Marland, who has been trying and failing to stop the New Order for many months now, was repaid for her cynical attempt to get on CONCORD killmails with her Tornado. She was popped by Agents Sophia Soprano and howling wind, at the very moment the gang was also killing this freighter. Ten million isk and some common sense, people. Is that too much to ask? Oi Oi Oi... The fails of some people. Brings a smile to the face knowing that through their loss they are bought closer to understanding how to play properly. I'm really wanting one of these Michi's Excavation Augmenters now! Did you ever go fishing? Did you ever catch all the fish? Been meaning to ask, what about the ISBoxers. This is the closest thing to botting I have ever seen. Its a step further past macroing and causes multitudes of accounts to receive keystrokes even though they were not directly interacted with. I would love to see a ISBoxer fleet on one of these posts! One of the great things about the Code is that it preaches self-reliance: if you want a better highsec bad enough, you'll be a part of creating it. Carebears, by contrast, are only heard wishing for "somebody" to solve their problems. Eric Benner: be Gallant, not Goofus! You see that Black Legion. gank in this article? It's done by an ISBoxer ganker. I love the writing on this site but I won't deny the obvious hypocrisy. It also goes to show they aren't fighting bot-aspirants but are really just looking to troll people. 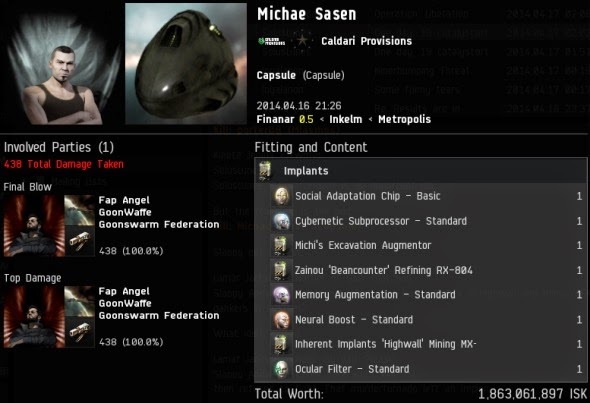 Which is fine I guess, since CCP seems to allow it. 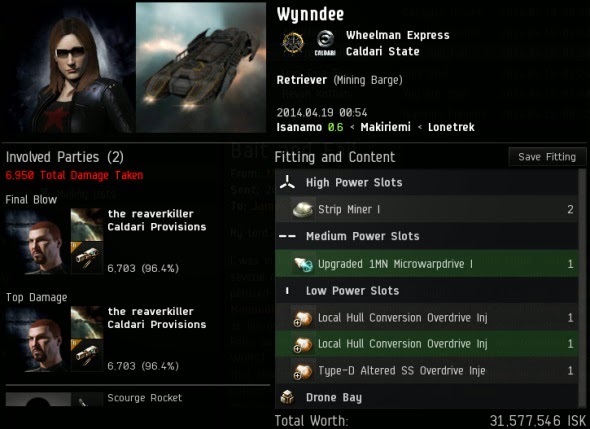 Let's just not delude that it's something else, or many gankers/gank fleets would face the same treatment the miners do. I am infact working towards training up some skills for such activities, would just like to see some hurt in the meantime. I dont have nearly the man power to do enough damage to an ISBoxer... yet. 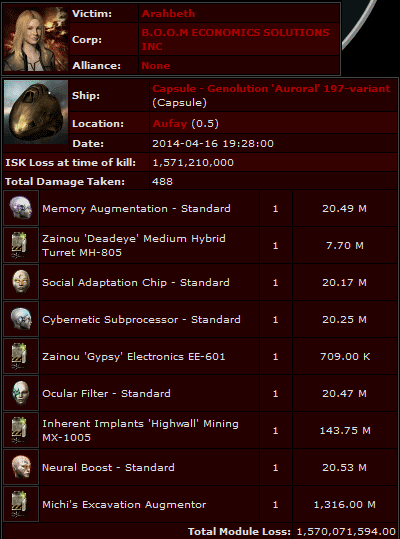 That Tornado gank cost the gankers roughly 2x the ISK of the anti-ganker. 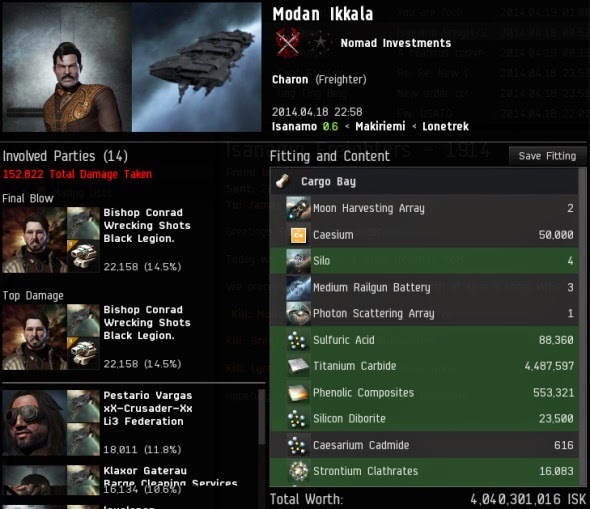 If the anti-ganker makes 50% or more ISK than the gankers involved do, the anti-ganker in fact "won" that fight. That is assuming both sides received killmails for eachother or the anti-ganker at least got a killmail off someone else. Of course it all comes down to goals. When I anti-gank my goal is to whore mails and turn some of their attention towards me. As such I personally would have "won" such encounter... I suppose it's unfair to apply that to all though. Apart From he got popped along with a 3.9 bill freighter with the same ships. So no you are wrong. I suppose I can win every encounter I participate in if I change my definition of 'winning' accordingly. But nothing wrong with KM-whoring - I enjoy it as much as everyone else! Whatever helps you sleep at night. If that's the intellectual backflipping you need to do to feel better about having your toys broken by NO Agents, then more power to you. Once again the care bear understands nothing beyond isk. There is nothing deeper to Eve for these uncreative fools than the in-game currency. The gankers had FUN. They fleeted up and played an MMO with other people. They imposed their will on a care bear, and shared the cleansing bath of tears. The gankers won the moment they became gankers and began laying low the nameless sheep of the high sec herd. What a magnanimous "saviour". He calls his lost sheep "another bunch of dead carebears". Keep saying it, James 315. The world will see you for who you truly are. Carebears are not dead. They just... smell funny. I could say the same about you... 24 hour a day stuck in a gooey pod without a decent shower. We already do see him for what he truly is, you even wrote it yourself "magnanimous saviour". You clearly see it too. Perhaps you missed the fact that by adding a quotation mark around the "magnanimous" I was conveying irony? No true saviour would harass, bump, gank and kill the people he is trying to save, and, while at it, claim that it's for the good of the saved. Last, but not least, judging by his RL statements supportting The Mittani and Erotica 1, he is a bully, or a supporter of bullies, and at the very least, a bully's accomplice. He is the kind of guy that at the very least will hold your clothes while the bullies are beating you out of your purse - and your life.